The design concept is based on the interaction between architecture and landscape. The transmissive structure creates permanent contact to the open spaces of the park and responds to the existing visual and spatial relationships. The existing topography flows through the building and forms a gently rising foyer. The concert hall grows formly out of the plateau and is cantilevered over the entrance hall. The chosen transparency and integration of internal circulation into the urban and landscape context emphasizes the public dimension of the building and exhibits the social event. 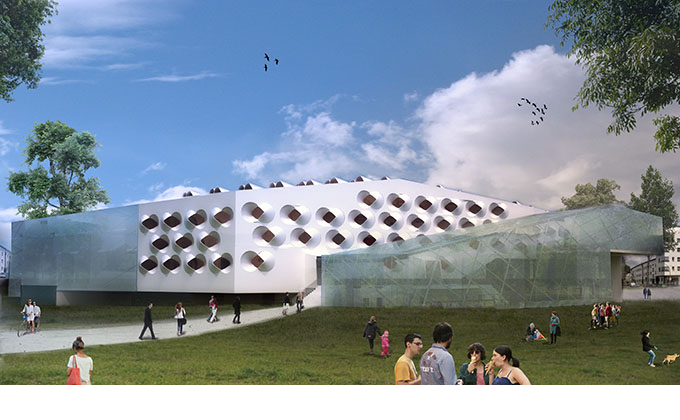 The music hall becomes a part of the park landscape, as the topography of the project site is left in initial state and can be felt by the visitor. Oppose to the theaters, music halls can be designed with daylight. The great Musikverein in Vienna also has a light gallery, which provides special atmosphere. The spacial properties influence the comfort of the recipient and thus his acoustic perception. A space with external connection for that special place in conjunction with excellent acoustics is the basis of our design for the concert hall. The concert hall is made as a reinforced concrete structure. The perforation of reinforced concrete with round holes reduces the weight and allows the static system act as a light rib construction. The conic sheds outdoors are intended as prefabricated metal elements that prevent direct sunlight in the room. The cones in the interior enhance the acoustics and are also designed as prefabricated metal elements. The perforation of the structure was also studied as an acoustic effective measure, considering static requierements as well as daylight and artificial lighting. Due to the union of all the components an authentic space was developed, including no decorative aids.